Training your dog isn’t just about teaching him new tricks. There are also some aspects of training that are extremely important for his day-to-day life and will help ensure that you share a happy and harmonious household with your canine companion. Good training can make the difference between having a well-behaved, happy and friendly dog and one that is mischievous, miserable and aggressive. Unfortunately, there are a number of mistakes that owners make when training their beloved pets and some of these can significantly derail your efforts. Here are some of the most common mistakes people make when training dogs and how to avoid them. By far the biggest mistake made by canine owners is failing to use positive reinforcement when training their pet. Dogs are a lot like children and respond much better to positivity than they do to punishment or dominance. If your pooch behaves inappropriately, you should try and distract them from the behavior with something that you can reward them for instead. For example, if you notice your dog chewing the furniture, grab something that he is allowed to chew – his toy – and offer it to him instead. Once he grabs it and chews it, reward him with lots of love and praise, and perhaps a treat. This helps reinforce where he should chew and where he shouldn’t. Never scream, stare-down or be physically aggressive with your dog. It won’t work and could cause him to retaliate with further undesirable behaviors. Inconsistent rules are extremely confusing to anyone, but especially to animals who do not necessarily understand the factors surrounding why something is ok one day but will cause him to be scolded the next. A perfect example is the ‘no pets on the bed’ rule that so many owners have. You may start out being very firm that your pampered pooch is not allowed on your bed under any circumstances. However, if one evening you are feeling unwell or lonely, you might decide to let him up for a cuddle after all. 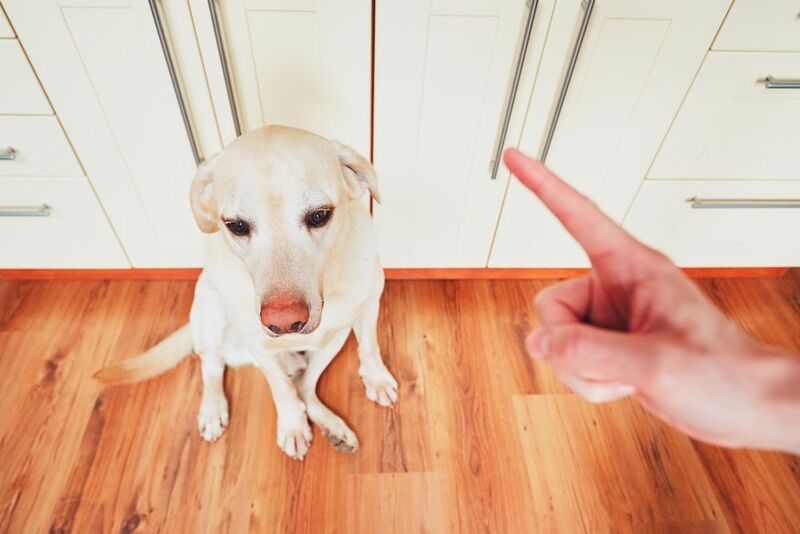 Your dog is now going to think the rules have changed, and if he tries to get up and is scolded the next day, he isn’t going to understand why he now can’t. The fairest thing that you can do when training your dog is to be consistent in your rules. Training cannot be mastered overnight and may require you to spend weeks or even months reinforcing certain behaviors. Many owners start with the best intentions, planning on having training sessions with their pet 3 or 4 times a week. However, we all know that life gets busy and things can get in the way. Unfortunately, not training regularly enough and going too long between sessions means that it will take much longer for your pet to get the hang of what he should be doing. Try and set aside even 10 minutes of training at least 3 times a week for the best results. Something else that many owners make the mistake of doing is trying to get their canine pal to master too many different things at once. Too many different things covered in one training session can lead to confusion, and if you cover one thing one session and something entirely different the next, you will be leaving it too long between practice sessions teaching the same thing. Instead, we strongly recommend that you focus on one area of training at a time and repeat until your dog has mastered it! Even the most well-behaved and well-trained dog can forget their training sometimes, and for this reason, training is really something that you will need to continue for the duration of your dog’s life. Many owners feel frustrated if they need to revisit training at various points, but this is completely normal and nothing to feel stressed about. And because your furbaby has learnt it previously, he will almost certainly get to grips with it again very quickly! If you need more advice on the best way to train your dog, including what things you should certainly avoid, our friendly team would be happy to help. Please contact the clinic at your convenience.